January 12, 2016 /15 Comments/in Singing /by Suzy S.
Get ready to free your vocal cords of strain, increase your breath capacity, and get the strength you need for powerful belts and the control for soft tones. 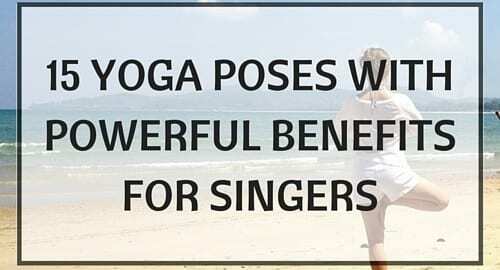 Going beyond simple breathing exercises for singing, the following yoga poses free your neck, shoulders, and spinal muscles of tension. Your breath and sound will move freely, and your core muscles will grow stronger so you can manipulate your voice. People tend to breathe shallow and in one favorite cavity of the body. Learning to use all cavities of the body will give you enough breath for belting and for long, held notes. Start either lying flat on your back or propped up with two yoga blocks, one block at the highest level and the second block at the medium height. While the Three-Part Breath teaches you how to breathe into all your front body cavities, now we’re going to explore our back body cavities to use your ultimate breath capacity. Start seated with your legs crossed and your feet flexed. The hardest area of the body to breathe into is the upper back. To find breath here, we will practice eagle arms. This will also give you the ability to hold belts and soft, unwavering tones. In yoga we practice breathing techniques called pranayama. Kapalabhati breath, translated from Sanskrit to “breath of fire,” will activate your core and clear your sinuses to give you beautiful, open notes instead of nasal and strained notes. Repeat this for 5-15 continuous rounds. To hold long notes and maintain the correct pitch with an unwavering tone, your breath must be even. Ujjayi breath, another pranayama technique in yoga, is the practice of finding evenness of breath. Repeat for 5-15 rounds. A lot of times when your voice strains to reach a note, your vocal cords are being pulled by tight muscles in your neck, shoulders, and back. To release these muscles, practice this easy restorative twist on a yoga bolster, a few stacked pillows, or stiff folded blankets. You may hold this twist for up to five minutes. Benefit: Relaxes the neck muscles to reduce strain. Another way to stretch out the muscles in your neck is with seated neck stretches. These stretches will target the back and the sides of the neck, and can be practiced multiple times throughout a day. One of my favorite neck massage tools is from Daiso, the most adorable Japanese store you’ll ever find. For this exercise you’ll need a towel and the neck massage tool, which can be purchased here or at your local Daiso store. If you don’t want to buy the Daiso neck massager, you can use tennis balls to relax your neck, which will help you avoid strain and increase your vocal range. If your spine is tense, EVERYTHING goes wrong. This is because your spine is connected to your brain and is in charge of relaying messages to your body. If there is any tension in the spine, it can cause blocks in the message pathways, and result in excess anxiety and other mental obstacles. Spinal tension can also cause postural problems, which limit your breathing and create muscle tension. In the video below you’ll learn how to massage your whole spine with two tennis balls. Don’t be alarmed if it feels very tender the first time. Give light pressure and do not practice it for too long. The more you maintain a self-massage practice, the more comfort you will find. The shoulders can be a tough place to get! Nail those shoulder knots that are pulling on your neck, throat, and vocal cords with this massage. Roll up a big fluffy towel and get ready for the cheapest and best spinal reliever of your life! Space in the spine will create more space for your breath to travel, giving you more breath capacity when singing. The key to singing is good posture — I’m sure you’ve heard this a billion times. Tadasana, or mountain pose, teaches you how to stand correctly and builds the muscles needed to avoid hunching the shoulders forward or arching the back so the ribs puff out. Correct posture will help you avoid straining your voice, and encourages evenness of breath to create controlled sound and power for belts. A variation of the ever-so-famous downward facing dog, this pose will lengthen your spine, creating space in between each vertebrae, and is another great way to open up the shoulders. Space in the spine equals space for breath, which leads to more power and control when singing. This forward fold and shoulder opener combo will have your spine, shoulders, and neck melting with relief! 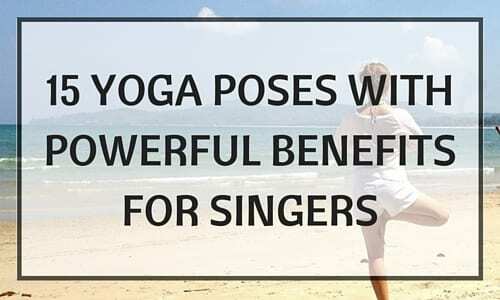 This pose will relax all of your throat muscles and vocal cords so you can access a full vocal range. If you have any questions or if any of these stretching and breathing exercises hurt, make sure to check with a qualified teacher. Feel free to contact me through TakeLessons for additional help! Shannen Roberts is a yoga instructor, singer, pianist and keyboardist, singer and songwriter, and founder of self-help site The Strange is Beautiful. She teaches in Valencia, CA, as well as online. Learn more about Shannen here! These are amazing! Ive been doing yoga to improve my breath control for a few years, and all of these will be a good addition to my practice. Hi, Excellent post.. Thank You so much..
very good and unique article. thanks for great information. keep up the good work. Wow.. This is amazing post. interesting and informative. Thank you for the sharing. This is an impressive Blog Thanks for sharing and hopefully you will share more in future also.